The 2016 World Travel Awards titled Indian Luxury train, Deccan Odyssey as Asia’s Leading Luxury Train 2016. The 23rd extravagant gala ceremony was held at InterContinental Danang Sun Peninsula Resort, Vietnam on 15th October 2016. Deccan Odyssey has won this award for the sixth time and consecutively for three years in a row. The award for Asia’s Leading Luxury Train 2016 came after fierce competition with Eastern & Oriental Express, Maharajas’ Express, Palace on Wheels and The Golden Chariot. World Travel Awards (WTA) rewards the very best travel organizations in the world. Every year the award ceremony honors those brands testing the boundaries of excellence and implementing ground-breaking ideas. It has been acclaimed as the Oscars of the Travel Industry. Each World Travel Awards Gala Ceremony offers unrivalled networking opportunities to members of the travel and tourism industry. 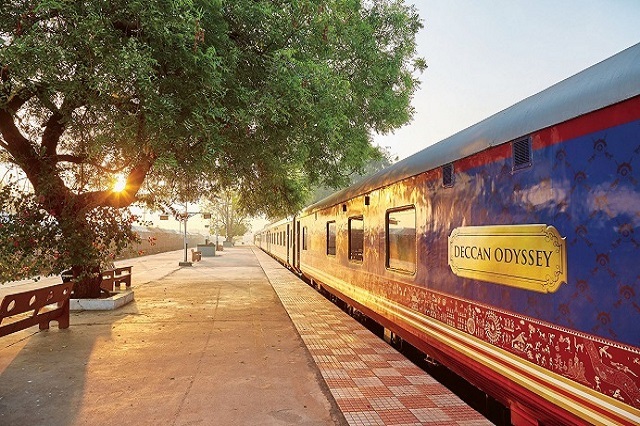 Deccan Odyssey is one of India’s leading luxury train. The train has 21 coaches, out of which 12 are passenger cars accommodating 88 passengers. There are 10 Deluxe Cars and 2 Presidential Suite Cars, 1 Conference/Entertainment Car, 2 Dining Cars, 2 Generator Cars with Luggage Store, 2 Staff Cars, 1 Spa Car and 1 Bar Car. All accommodation cabins are air-conditioned with speed Wi-Fi. The train has on-board facilities like LCD TV, channel music, gymnasium, beauty salon, paramedic on board, foreign exchange facilities, special suite coach for specially-abled people, etc. the staff caters to your needs and creates a comfortable travel. The elegant Deccan Odyssey follows six journeys. The train stops over in India’s best tourists’ spots like Jaipur, Udaipur, Kutch, Ajanta caves, Goa, Mumbai, Shirdi, Sasan Gir, Delhi and Ahmedabad. The train offers memorable journey through architectural splendors, expeditions through the royal dynasties, spiritual places and a glorious history. The luxury train of India offers royal journey as it is equipped with a state-of-the-art amenities, opulent decor and an experience of a lifetime.